The Beneath Heat ’15mm Slim Clip System’ has been developed to be used where screeding is not an option. 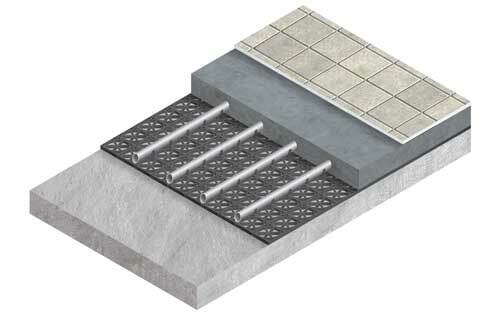 The Beneath Heat ’15mm Slim Clip System’ is used for solid existing floors. The sub floor below needs to be flat and cleared of any debris. 12mm Slim Clip Mesh is to be screwed to the sub floor. Beneath Heat pipework is then laid in accordance with the Beneath Heat design provided. Pipe is secured by being pushed into the grooves provided. Beneath Heat pipework is connected to the manifold, filled & tested. 15mm Self leveller compound is to be laid in preparation for floor covering.